As for all dural fistulas, the goal is to plug up the hole between the artery and the vein. This can be done from either arterial or venous side. Most operators will agree that venous methods tend to be less morbid, though overall hazards of cavernous fistula treatments are substantially higher than sigmoid ones, for example. Access to the venous side of the cavernous sinus is most straightforward via the inferior petrosal sinus. This channel can be occasionally traversed even when it is seemingly absent or, better, when it is known to have been open at some point and since then thrombosed — see the definitive manuscript on this approach by the Toronto Group. 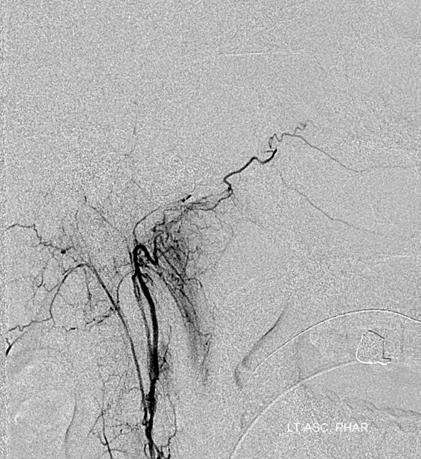 Another route is via direct puncture or cutdown of the superior ophthalmic vein (we prefer cutdown). 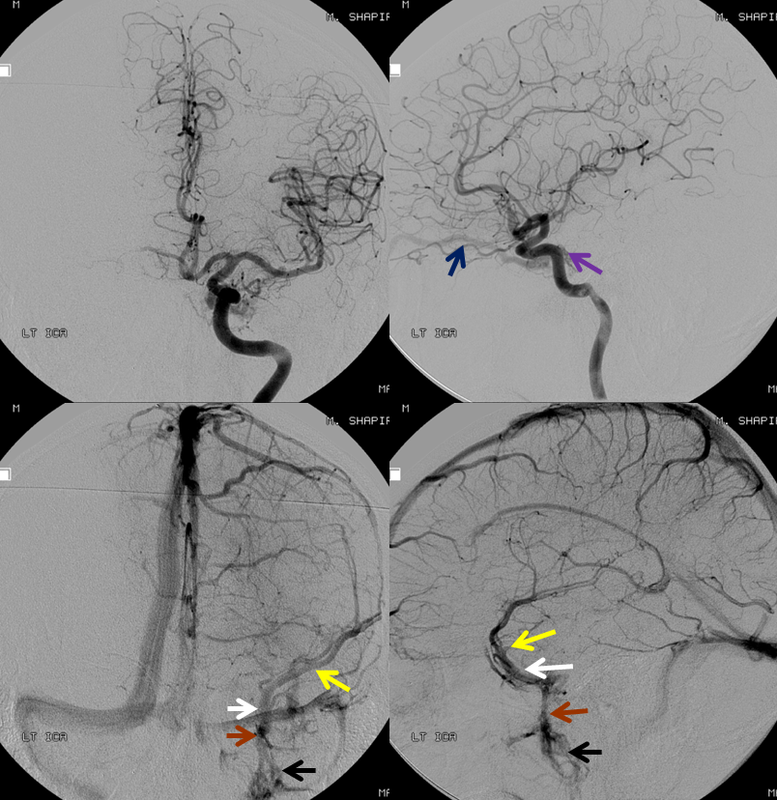 Common transarterial approaches include the ascending clival branches of the neuromeningeal trunk of the ascending pharyngeal artery (our preferred route); the middle meningeal artery, foramen rotundum branch of the IMAX, or most rarely the meningohypophyseal / inferolateral trunks. 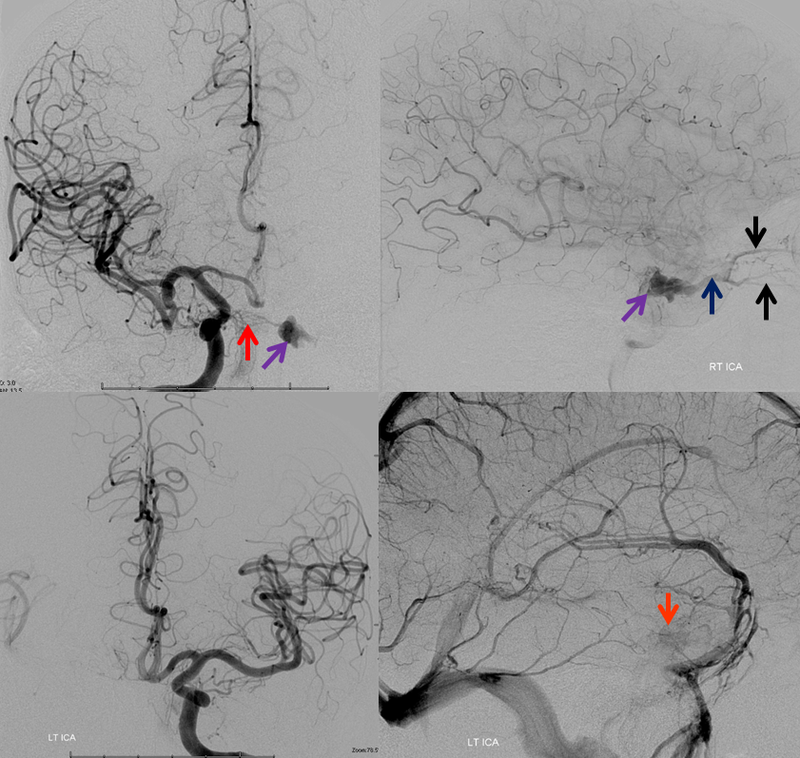 Because of the certain association between each of these vessels and corresponding cranial nerves, as well as their proximity to main intracranial arterial trunks such as the ICA, arterial embolization of cavernous fistulas carries a substantial degree of hazard and requires appropriate understanding of anatomy. 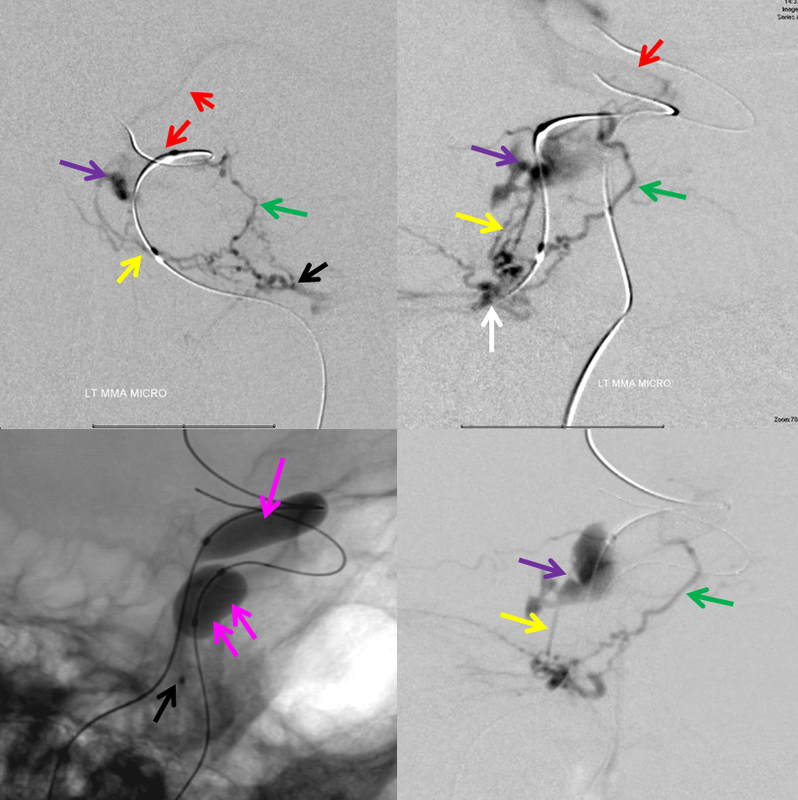 The following case illustrates some relevant factors in transarterial embolization. 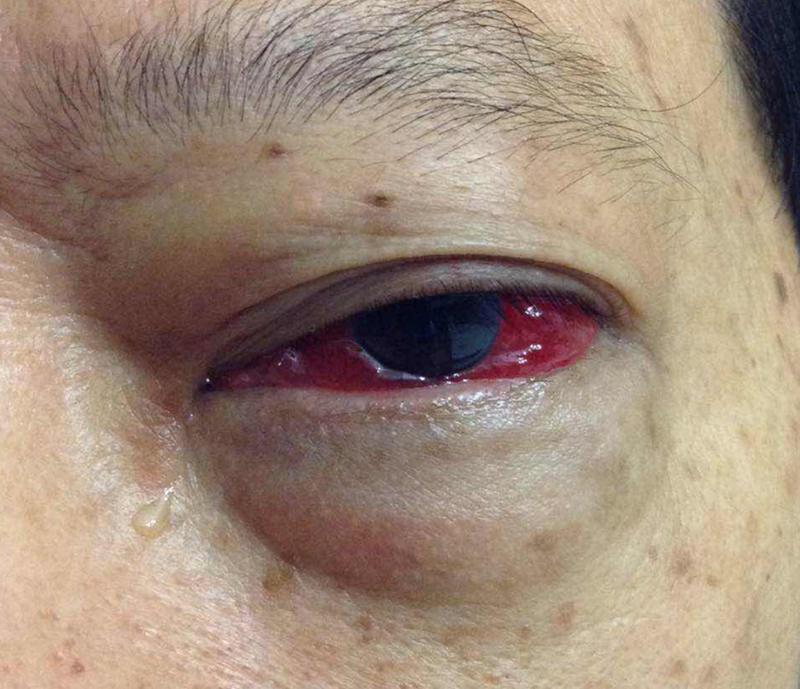 This patient presented with mild left proptosis, chemosis, and CN VI palsy. Occular pressures were normal. There was no bruit. Fistula was suspected based on a CTA. 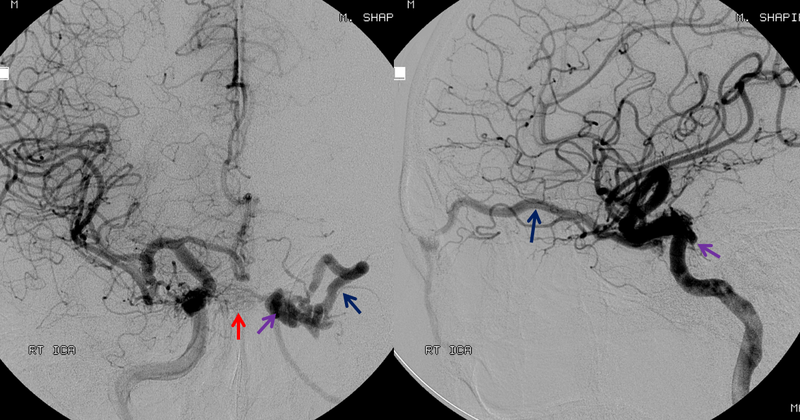 Injection of the right ICA shows a fistula in the posterior aspect of the left cavernous sinus (purple), supplied by posterior hypophyseal branches (red) of the right meningohypophyseal trunk (MHT). 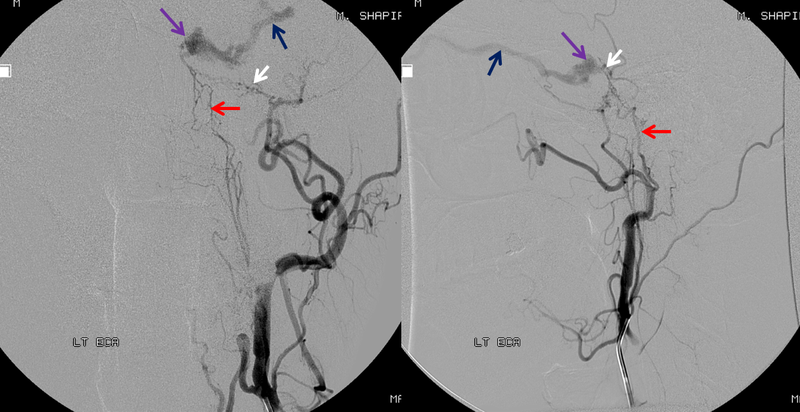 The fistula drains primarily into the congested left superior ophthalmic vein (blue), and subsequently into the angular / facial veins. 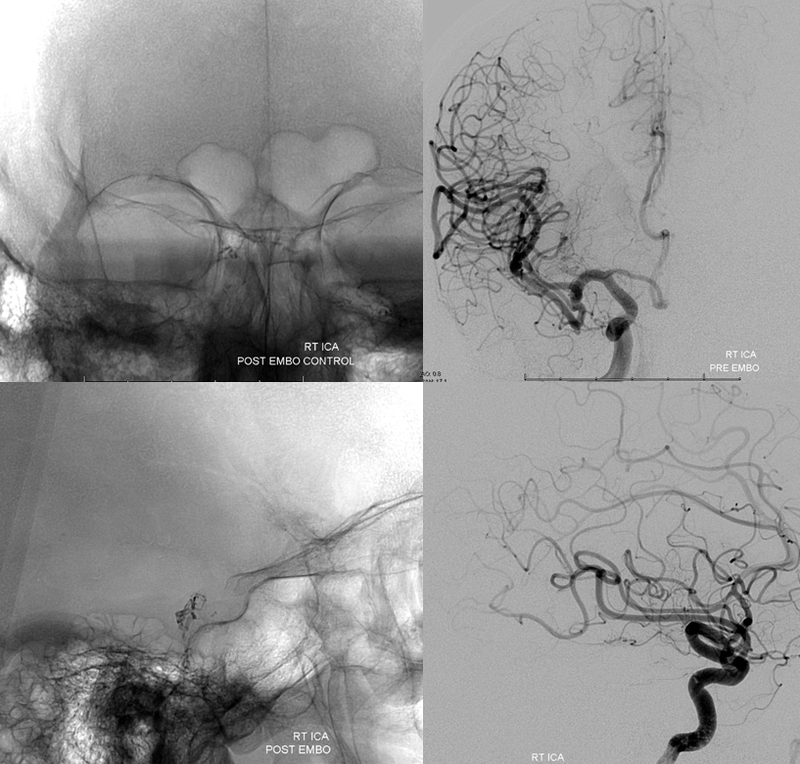 Injection of the left ICA shows the ipsilateral left MHT to participate less in the shunt than the right MHT, which suggests that the fistula is located in the medial posterior wall of the left cavernous sinus. 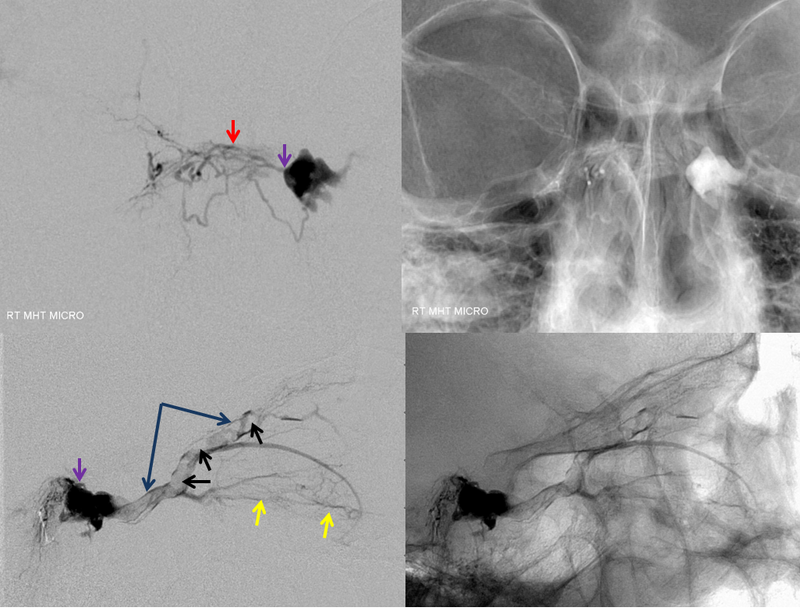 Notice a superb example of cavernous sinus compartmentalization, with venous phase images demonstrating drainage of the superficial sylvians veins/sphenoparietal sinus (yellow) into the lateral compartment of the left cavernous sinus (white). This compartment is completely separate from the fistula, and drains via the foramen rotundum venous plexus (brown) into the pterygopalatine venous plexus. As usual, angiogram provides a complete explanation for the changes. The left superior ophthalmic vein — the main outflow channel — is now closed. There is no effective alternative outflow, with secondary marked intra-cavernous (orange) and intra-orbital (black) congestion. Progressive thrombosis has minimized contribution of the left MHT to the fistula. The lateral images are now oriented to the right. nBCA injection movie shown below.